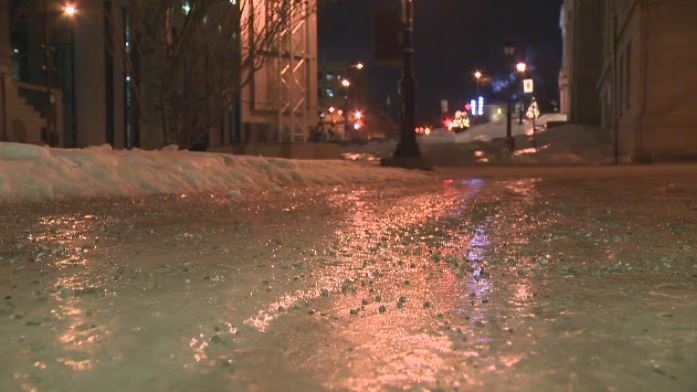 As predicted, the streets and sidewalks of Montreal and southern Quebec were coated in ice on Tuesday morning. Temperatures will remain above 0C until mid-afternoon, after which it will drop to -13C overnight. The icy conditions forced several schools north of Montreal to close on Tuesday. 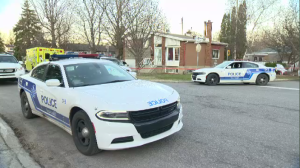 Police closed a few streets and the Charlevoix bridge in Montreal early Tuesday, although snow removal crews said they have almost completed removing snow and ice from the entire city since the last major snowfall. Residents of Cote des Neiges-Notre Dame de Grace found it hard to believe that the borough is reporting 100 percent of streets are cleared of snow. Many people living in that neighbourhood have been complaining about the quality of snow removal this year. Borough Mayor Sue Montgomery said she was aware of the complaints and said the borough was doing everything it could to ensure the flash freeze did not create more problems. "I am in constant contact, even on the weekends, with our public works. I just got off the phone with the director of our borough saying if need be I will call in reinforcements from downtown," said Montgomery. "But he assured me they are going to take teams that are working on aqueducts this afternoon to clear the sewers." On Tuesday many side streets in the borough were difficult to drive on, with cars being forced to travel in deep ruts as snow is piled in the middle of the road. Walking was no easier as sidewalks were coated in ice. Borough officials said that crews have had difficulty because three major snow removal vehicles broke down. If that sounds familiar, it's because two snow throwers broke down the previous year. Last week, Mayor Valerie Plante wrote a letter to all borough mayors urging them to improve their snow removal. The opposition at City Hall says the Plante administration missed an opportunity to pick up snow in November and early December, which is causing headaches for Montrealers now. "The sidewalks are atrocious. People with limited mobility, elders can't get out," Perez explained. "And all we hear is that we're trying the best we can, things aren't as bad, climate change." The city's point man on snow removal, however, says that's not what is complicated matters for Montrealers. "The real impact is the weather variation. It's incredible - since two weeks ago we have minus 20, and after that it's plus 6," Jean-Francois Parenteau said. After the drop in temperatures Tuesday evening, Wednesday will remain chilly while temperatures will climb above 0C again on Thursday and Friday, and that will bring yet more rain and freezing rain.